I was set to play on Sunday. I had all my gear together and set aside, and knowing the show-up time was 6:30pm, I was watching Disney-Pixar shorts on Netflix at 6pm when I got a text. So there was a lot of Derp!, a hasty loading of the car, the slightest of soundchecks, and, despite all that, a reasonably decent gig. I knew the songs, mostly, so I didn't embarrass myself too much. I did some, though. The first is the partscaster you see to your right. Despite the pots you see sticking through the control plate, it has no controls. It's pickup-to-jack. 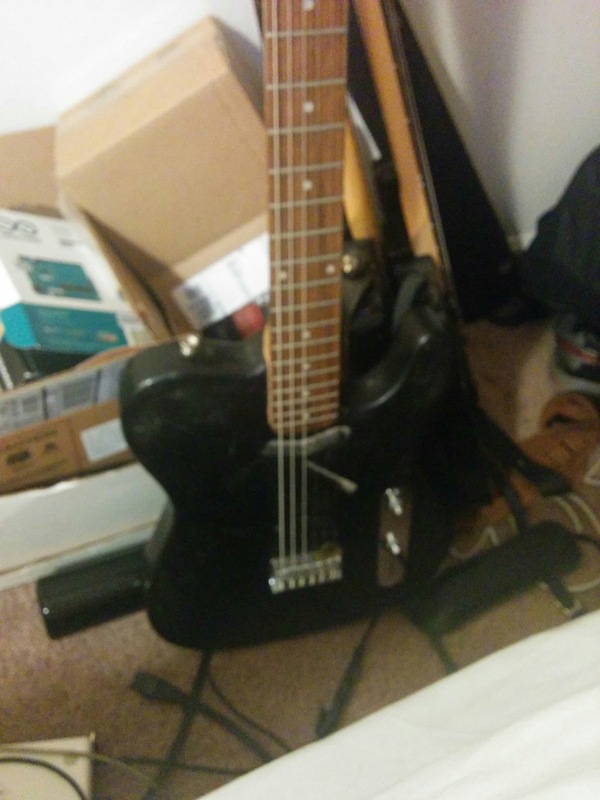 It's a partscaster, built from a factory second body from Guitar Fetish, a $5 bridge pickup from Reverb mounted to the body, and a neck salvaged from my son's first guitar, a First Act instrument where the body broke near the tremolo bridge mount. It's proudly a mongrel, and I've enjoyed it as a bedroom guitar. But I rarely plug in my bedroom guitars, and I found while playing it, in front of people with only the most minimal of soundchecks, that the ringing highs I love while playing it unplugged turned into a shrill icepick when going through my pedalboard and the venue's amp. I generally tilt my pickups a little toward the high strings, in order to balance string volume. Plugging into my Frontman 25R with knobs at 12 o'clock, I went in with a screwdriver and reversed that. We'll see next practice how that goes. A key part of my pedalboard is the volume pedal. I love to swell in, working with my delay pedal to get a keyboard pad effect. But, they've been having problems with hum, and so there's a noise gate on the amp mic. Which means I pick quietly and get nothing, and I pick louder and I get a surprising pop from out of nowhere. I've talked to the sound guy, and next time, I'll have time to get that worked out better.